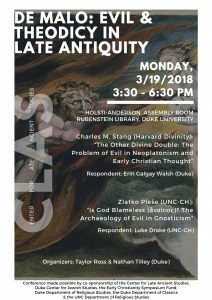 Increasingly, studies of late antiquity have problematized easy boundaries between religion and philosophy, as well as discrete labels of identity like “Neoplatonic,” “Christian,” and “Gnostic.” Neat divisions of this sort too easily gloss over the material realities of late ancient social and intellectual exchange. Elite thinkers in the period often interacted with partisans of ‘competing’ schools and, in many cases, allowed such dialogue to shape their own thought and practice. 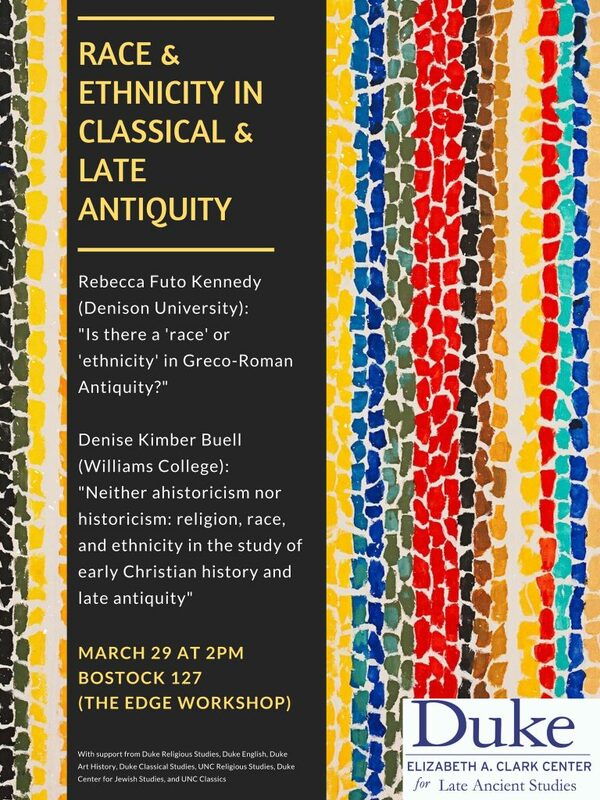 Tracing these genealogical lines of intellectual cross-pollination promises to illuminate our understanding of particular religious/philosophical groups and the nature of late antique cultural exchange in general. 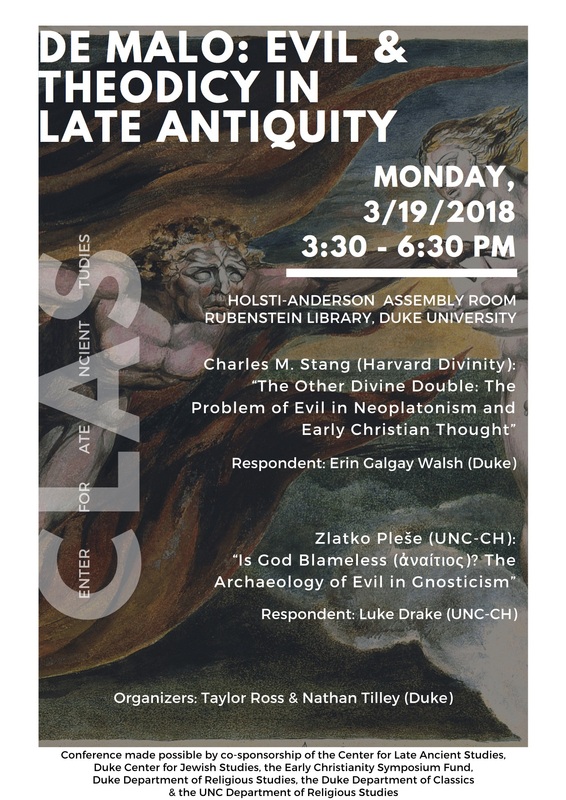 Our symposium this year takes up the question of intersecting identities in late antiquity by examining how late Platonism, Gnostic texts, Christian theologians, and Hermetic literature share common strategies of speaking about evil and theodicy. Description: Textual artifacts provide scholars vital tools for reconstructing and studying the nature and inter-relationship of authors, texts, and textual communities in the ancient world. 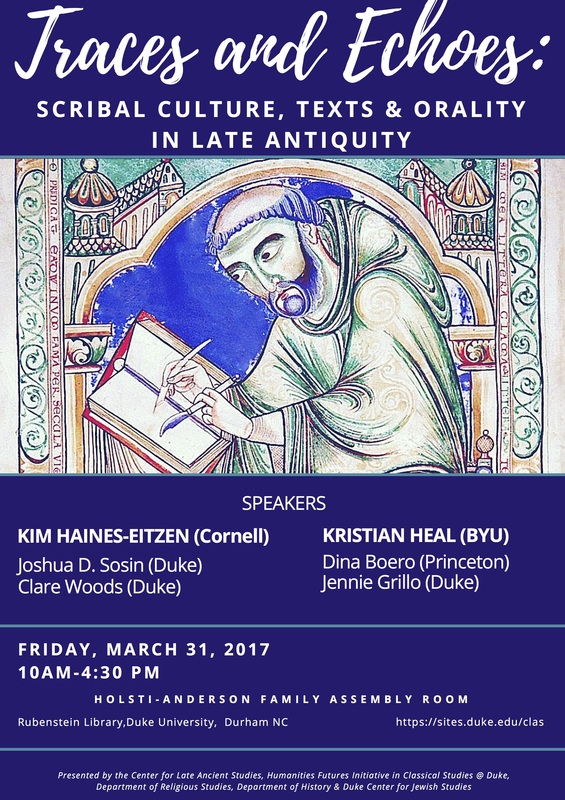 In the field of Late Antiquity, paleographical, papyrological, and codicological skills equip researchers for exploring issues ranging from scribal culture and textual transmission to reconstructing orality and reimagining shades of “literacy.” This CLAS symposium addresses the following questions: What can graphic and paratextual features of texts reveal about orality, composition practices, and the sociability of texts in the ancient world? What similarities and differences exist between Christian and non-Christian scribal practices and what can these reveal about the nature and relationship of distinct religious communities? What are future frontiers for research? 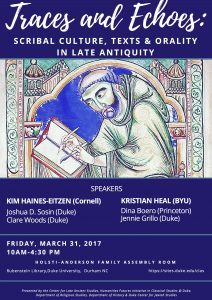 What are the implications of the digital humanities for the study of the ancient world? 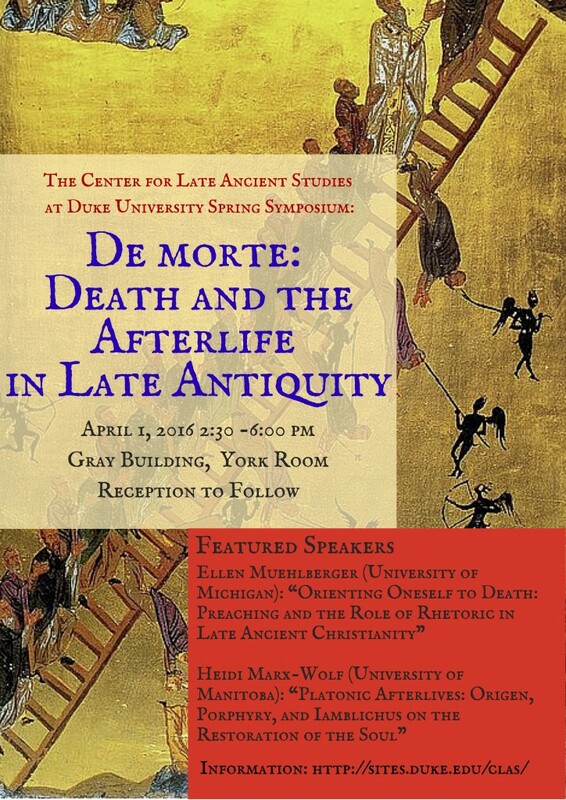 The Elizabeth A. Clark Center for Late Ancient Studies is powered by WordPress at Duke WordPress Sites. Please read the Duke Wordpress Policies. Contact the Duke WordPress team.